An amazing mask four acne prone skin for general moisturizing and balancing of healthy skin. Draws out impurities and inhibits bacteria in pores & delivers a dose of moisture to acne prone skin. Deep cleans pores, fights breakouts, and controls excess oils, while still hydrating your skin. Apply to clean and dry skin. Rinse off with warm water and your favorite cleanser after 20 minutes. Can be used 2-3 times per week. 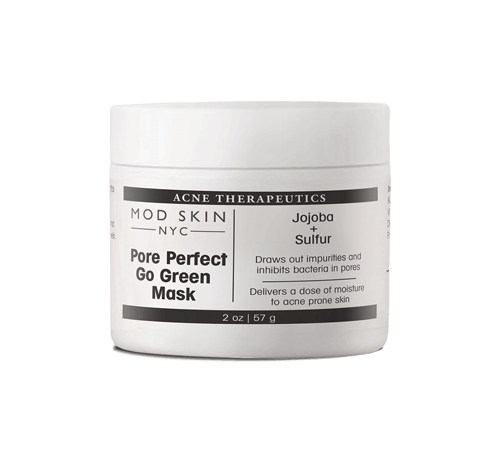 Sulfur- causes a mild shedding of the top layer of skin, cleansing clogged pores and helping uneven texture. Wheat Germ Oil- a botanical oil filled with vitamin e, which helps reverse the sign of aging, sun damage and fights free radical damage. At The Dermatology & Laser Group in New York City we commonly recommend this product for inflamed and irritated skin.